Okay, why the extra click? To invite you to sign up for The Loyalty Letter. 99 Nonprofits™, right click here and click “save target as” to save, print and share. (You need Adobe to read this PDF report. The Loyalty Letter. Do you? It’s the free monthly e-mail newsletter from Lisa Sargent (that’s me! 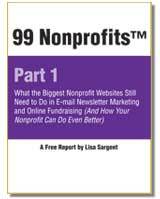 ), all about helping fabulous nonprofits (that’s you!) keep more donors connected and giving. So if you haven’t yet subscribed, enter your email address in the box below and click go! Enjoy your report, and thanks for subscribing to The Loyalty Letter!